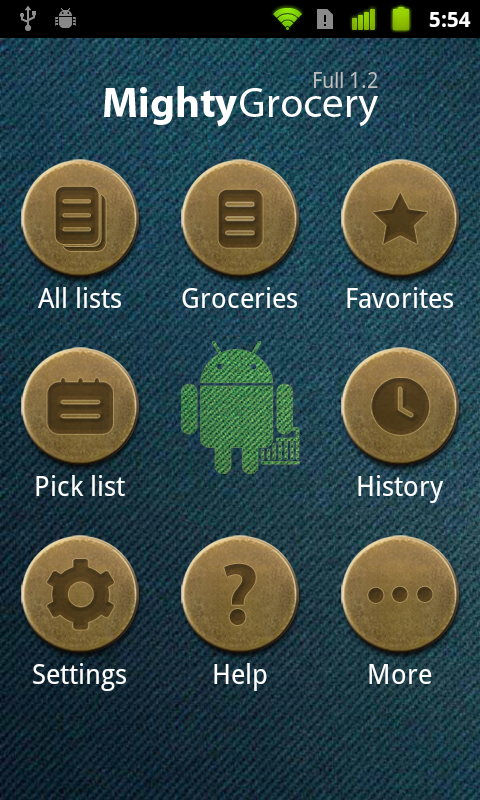 Mighty Grocery dashboard displays a few customizable buttons which allow quick access to application features. A Single tap on a button will navigate you to the selected screen. Tap Android icon to change Design theme or go to any tab of the app. Information messages are displayed in the bottom of the screen. You can hide any message by tapping x on the right side, or you can long-tap the banner and choose Dismiss All. Just long-tap a button and select a page which you’d like to assign to the button. 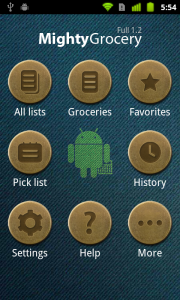 You can also Reset all customizations made to the buttons. Settings – opens settings screen. Help – opens this page. About – opens web page with information about application. Tom, in order to share shopping lists, including ability to add items to another person list, please follow instructions in the Sync with Cloud User’s Guide.